Pie Predicts Sunnier Economic Times? Can pie purchasing predict more clams for us all? Let us be hopeful and give thanks. We're not sure we go in totally for the whole "shorter skirts equal more optimistic economic times ahead" or that outlandish haircuts or popular dog breeds or the type of shows we watch point the way to where things are headed. 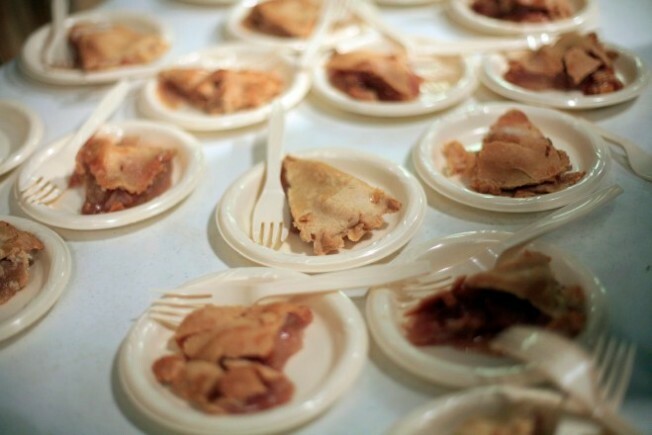 But maybe we do a little, that's why we've been cheered by the healthy pie lines around town. Figure the pie -- be it pecan, pumpkin or French apple -- is not necessarily the must-eat of the Thanksgiving table (we'll say with confidence that's the bird). Stuffing is not expensive, nor are potatoes, so those usually make the cut. Rolls? Cheap. But in more challenging, leaner-wallet times desserts can fall by the wayside, a sad thing indeed. But we're not sad today, as we spied both Du-Par's at Farmers Market and Marie Callendar's doing healthy pie-based business this week. We'd even say people were clamoring for round, tin-encased dessert-y goodness. It's true that we've seen longer pie lines in the past, but the queues this year aren't nearly as bleak as we'd fretted. How's House of Pies doing? Pie 'N Burger? Other dessert-a-tariums around town? We can only hope that people are putting a growing confidence in a sugary slice of something good. Brighter times could be just around the corner, if pie predicts correctly. And we believe in pie.